to keep the games alive in modern times. THE FOUNDATION'S PURPOSE IS TO KEEP THE TRADITIONAL FILIPINO GAMES ALIVE IN OUR COUNTRY, AND INTRODUCE THE GAMES OF OUR HERITAGE AMONG THE NEW GENERATION OF FILIPINOS. Since the 1990's Magna Kultura has been using various forms of media and arts to instill the Filipino Spirit among our fellow-FIlipinos, especially the new youth generation. In the process of promoting history and patriotism, many people find lectures, exhibits, stage performances and reading materials somewhat a "sleepy" approach to learning. Amidst the age of hight-tech media and internet, adults are looking for more entertaining and exciting ways to gain knowledge and experience; and, children... they just want to play. Magna Kultura tried many forms of expressions and many of which were successful. Among the outreach programs, Magna Kultura saw that the Larong Pinoy Program was surprisingly effective and solicited public interest. Adults and elders, even children, were very interested in the heritage games. Thus, the Larong Pinoy outreach activities became potent vehicle for promoting Patriotism. It was a subtle and fun way for instilling Filipino spirit among the youth. Larong Pinoy teaches the youth to love things that are Filipino. In the age of globalism, let us preserve our culture. Besides teaching them knowledge and technology from other nations, let us also instill in their hearts that they are Filipinos in the the global community. And let them be proud Filipinos. Magna Kultura Foundation is a Non-Government Oorganization (NGO) advocating Philippine arts and culture. with programs conducted at the grassroots of society. The re-institutionalization of the Philippine Indineous Games is among its major advocacy. At the turn of the millenium, Magna Kultura started the advocacy by the creating a Larong Pinoy sports clinic, to teach the children the game mechanics, as well as to properly play it in a tournament style. Magna Kultura believes that the games are as challenging and fun as any western game. To INSTILL PATRIOTISM and love of things that are Filipino. 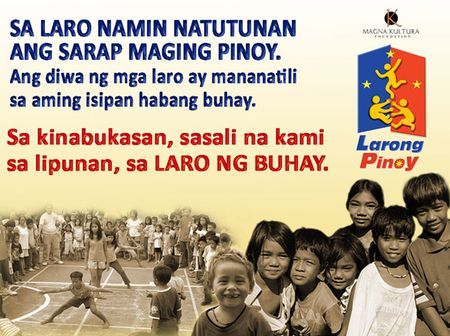 Larong Pinoy is a light and subtle way of instilling the Filipino Spirit among children without lecturing or “preaching” about Patriotism. 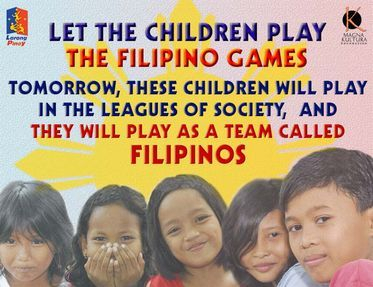 Anyone who experience Larong Pinoy never forget the memories of playing the games. It will always be a part of their lives. To use the games as A Bridge for BONDING the YOUTH with PARENTS and ELDERS (lolo, lola, uncles, etc.) Before the era of modern games and high-gadgets, Larong Pinoy was the game of our parents and ancestors. Providing children with the knowledge and experience of the games allows them to “connect” & relate with their relatives and other adults. To ENLIVEN COMMUNITIES by bringing back the fun in neighborhood, with kids playing with their peers. Larong Pinoy engages the youth in physical activity and paves the way for interaction with other children in the neighbourhood. It enliven the neighborhood, making the community a vibrant place to live in. 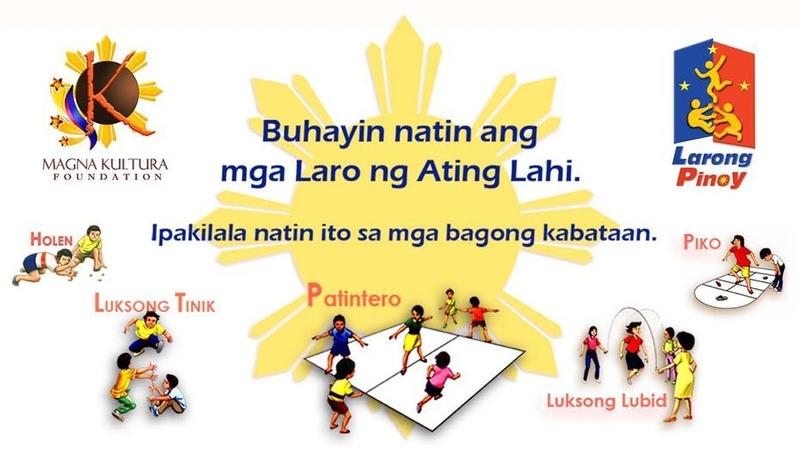 LARONG PINOY PROMOTES HEALTHY PHYSICAL, SOCIAL AND MENTAL DEVELOPMENT OF YOUNG PEOPLE. It promotes PHYSICAL (energy), SOCIAL (camaraderie) and EMOTIONAL (fun) activities through outdoor activities. The physical and health benefits of outdoor play are obvious, and the social & personal benefits are equally as important. The advent of information technology has ushered high-tech gadgets and computer games that has fascinated children and even adults. Computers and game gadgets are mostly played indoor, with less outdoor physical activity and bonding among neighborhood friends. In many urban and rural areas, however, a great majority of Filipino children still find time to play outdoor indigenous games with their neighborhood friends, as most of them are still unable to own expensive high-tech gadgets. Unlike children who grew up playing in the streets, some grew up with modern technology don’t have “kababata” in their neighborhood, as their friends are contacted within the virtual scenario, “ka-Chat” at “Friendster” or “Yahoo Messenger”. Children need to have physical outdoor activity with real friends. Why Are We Promoting The Indigenous Games? Larong Pinoy is a Cultural TreasureYaman ng Lahi). It is the Games of our Heritage (Laro ng Lahi). These are the games that our forefathers grew up with. Many adults and elders would like to pass on the fun tradition to make the new generation experience the fun of being truly Filipinos. The Filipino Games are timeless. It is still well-loved and cherished by many, as it is part of our heritage. Larong Pinoy’s popularity encompasses not only the youth, but adult and elderly generation as well. It’s a timeless cultural treasure. The games are still being played in urban & rural communities, by a majority population who have no access to high technology. The games are still taught in public schools. While Filipino street games have been organized seasonally in the past by government organization’s and private commercial enterprises, the Games has never been sustained and revived to its once popular stature. Currently, no government or private entity has established a legitimate organization for Larong Pinoy. Furthermore, our country does not have School for Larong Pinoy, unlike sports training clinics that have propagated for western sports. Magna Kultura aims to contually revive the games of our heritage, with the establishment of a sports infrastructure to re-institutionalize these with a sports curriculum in schools and barangays. Outreach sports clinics were conducted by Magna Kultura coordinating with schools and barangays, to impart the game mechanics and the official tournament rules.